These are some of the sentiments that Bob Nevins hears from veterans who have been touched by the Saratoga Warhorse experience. Nevins is the founder and executive director of Saratoga Warhorse, an organization he started in 2011 because of the record number of suicides reported among military veterans. A former medical helicopter evacuation pilot and decorated Vietnam veteran, Nevins saw the need to help those struggling with the invisible, psychological wounds inflicted upon many of our nation’s military personnel. Saratoga Warhorse offers veterans an experience that goes far beyond the traditional therapies often provided by military resources and by most accounts provides a life-altering breakthrough for participants. Nevins offers veterans the opportunity to participate in the program and emphasizes to each veteran that Saratoga Warhorse is not a mental health counseling service but a “peer-to-peer experience with a horse that could be life changing,” and then ultimately leaves it up to the veteran to decide whether they wish to participate. The three-day experience, held in Saratoga Springs, New York or Aiken, South Carolina, is offered to veterans at no charge. The experience begins with a casual welcome dinner and, the following morning, Saratoga Warhorse staff and veterans convene to begin a half day classroom session conducted by Nevins and equine director, Melody Squier. As most veterans have little or no horse experience, the classroom time initially focuses on a general introduction to horses and safety and is followed by the fundamentals of natural horsemanship. “We aren’t turning them into horse people, we are giving them the information they will need to be successful with the horses,” said Nevins. Natural horsemanship, a training method rooted in the idea that horses are herd animals and have evolved due to their ability to flee from predators, utilizes a system of two-way communication between the horse and human that focuses on humans using body language to communicate with the horse without fear or dominance. The ultimate goal is for the horse to respond to the human with an expression of trust and thereby inviting the human to become part of the horse’s “herd”. As natural horsemanship philosophy dictates, when a veteran enters the round pen with a horse, the horse instinctually sees them as a predator so it is up to the veteran to communicate with the horse, build a relationship and ultimately establish trust that results in the horse voluntarily approaching and engaging the veteran. It is at this critical moment where something unexplainable is triggered. Saratoga Warhorse uses only former Thoroughbred racehorses in the program because of the strong parallels between the horses and the veterans. The veterans can relate to the ex-racers because, both veteran and Thoroughbred alike, often struggle to find a suitable second career. Additionally, “the synergistic effect of world class racehorses and world class soldiers working together is significant for many veterans,” said Nevins. By the end of the year, Saratoga Warhorse estimates that nearly 200 veterans will have participated in the experience. 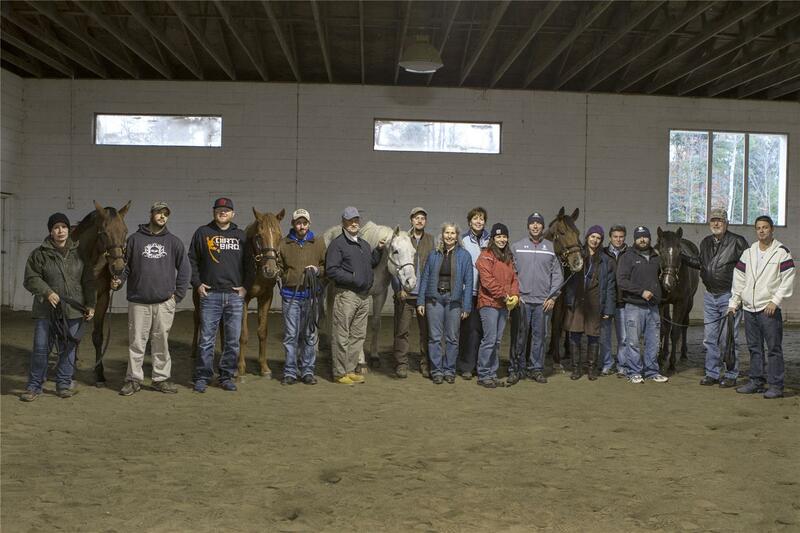 In 2014, TCA’s grant to Saratoga Warhorse assisted with horse care and program expenses. TCA is proud to support a program that not only provides a second career for Thoroughbreds but also is working to better the lives of our nation’s veterans.